Well, our plans to explore south were put back a week. We headed out last Monday but the wind very quickly got up so we decided to turn the other way and head back to the sheltered bays near St Florent (you need your atlases here). It turned out that was a wise decision as the forecast the following morning was force 8 and 9, so we tucked in to an even more sheltered corner where we spent most of the week quite comfortably. It just goes to show that you can't make plans too precisely when sailing. 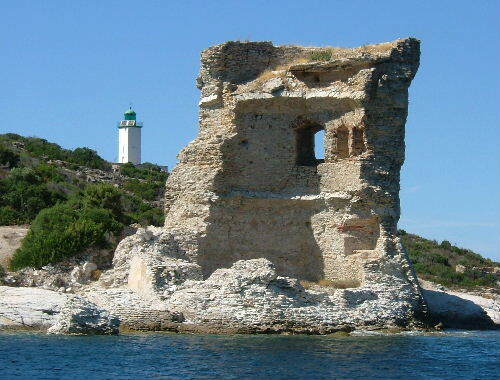 Here's a couple of pics of the original "Martello" tower - or what's left of it - next to our anchorage. 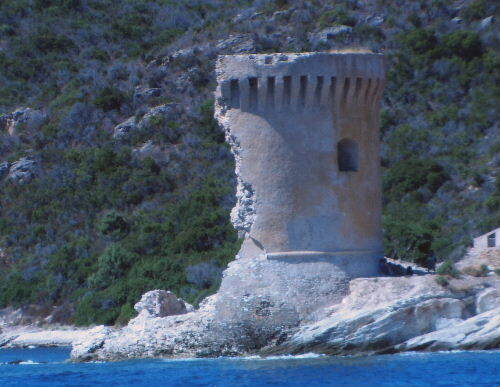 This is in fact the MOrtellA tower, built by the Genoese around 1520 for defence against pirates. In February 1794 Britain came to the aid of Pascal Paoli to help eject the Genoese (the fleet included Horatio Nelson commanding the Agamemnon). The towns were easily taken but this tower was very resistent. The British were so impressed with the design of the tower that they built many along the south coast of England to protect against an invasion of the British south coast by Napoleon (who was born in Corsica...). We had some entertainment watching other boats drag their anchors in the gale. We are used to the English Channel and using plenty of anchor chain (we have 80m of chain plus 80m of warp), but the boats here are used to the Med, they let the anchor touch the bottom and reckon the job is done. Not surprisingly, lots of boats dragged and one motor boat was a mile out (with people sunbathing on the foredeck) before they noticed that the coast was getting further away. The winds here are quite strange, though last week's gales were a result of a weather system in the western Med, there are funny local winds too. Last night early evening, there was calm, then in the space of only two minutes it was blowing 20 knots from the wrong direction and half an hour later it was all over - calm again. Be prepared is, I think the motto. We're enjoying "just messing about in boats" and we've done quite a few of our chores in between naps. Next task is to commission the watermaker which is now all ready to go. See next week's exciting report ! We hope you are all enjoying the Summer back home. We found the Westerlies ...??!!? Last week for Quiz Answers ! Monsters of the Deep ! Are We Nearly There Yet ? Congratulations Gemma and Neil !